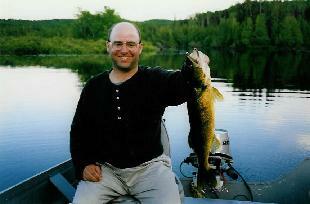 Walleye are one of the predominant species of fish on the lake and can be caught in abundance all season. Catch walleye in the river mouths, at drop-offs and underwater shoals. They are one of the tastiest fish you can eat and for that reason are very popular with our guests. Walleye caught in cooler waters have a distinctive hue that can be a nice surprise for anglers used to catching walleye in slightly warmer waters. Even in summer, holes around Poplar Ridge tend to remain cool. Cool lake temperatures also increase the activity level of walleye. 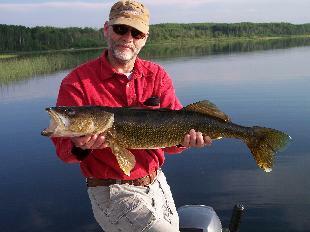 The largest walleye caught in Larkin Lake was 32 inches (about 10 pounds) in July 2006. 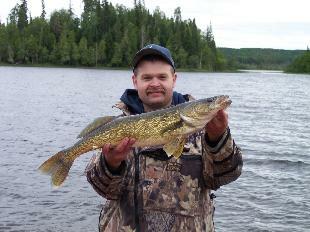 The larger walleye are usually found in May, just after the spawn. Good eating sizes (15 - 18 inches) can be caught in abundance the rest of the season.